"Your horse will appreciate the time and attention he is receiving from you while being groomed." Whether you view horse grooming as a "chore" or an enjoyable activity, bare in mind you're not only keeping your horse's coat looking healthy and shiny, but grooming allows you to further develop trust and bonding with your horse. Also, grooming your horse regularly can alert you to any signs of skin diseases, infections, or injuries. And wouldn't you rather gaze out your window at your horse who appears all clean and brushed and not dirty and mangy? Horse grooming does not have to be long and laborious. With the right tools and established routine, you can be done in no time. For starters, keep all of your horse grooming tools in a carry container so they are easy to find and so you don't have to go running back and forth to look for and fetch the tool you need. Groom your horse in an open area and secure him using a halter and lead rope by tying him loosely to a post or railing using a quick release knot. This way, should your horse panic and bolt, this will lessen the risk of injury to both of you. Where do you begin grooming your horse? Some people start with the hooves, while some start with the head, and others simply start somewhere in between. It really doesn't matter where you start, it's the fact you are taking the time to care for your horse that counts. My preference is to start with the hooves. Using a hoof pick, remove any debris starting with the heel moving toward the toe. Use a brush to remove any remaining dirt. Using a damp sponge, gently clean around your horse's eyes, muzzle and ears. 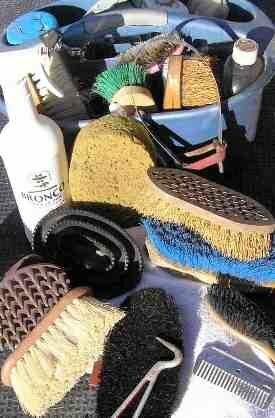 You can carefully use a very soft bristle brush to brush along the face and forelock areas if your horse will let you. I prefer just using a grooming mitt and my hand. Using a rubber currycomb, use soft circular motions from the top of your horse's neck down toward his shoulders. Then use a brush to remove the dirt loosened by the curry comb. Use the rubber currycomb to loosen dirt on your horse's body by using smooth circular strokes. Be careful in bony areas such as the shoulders and back. To loosen dirt, it is best to go against the grain of the hair. Next, use a brush in a downward direction to flick away dirt loosened by the currycomb. Once most of the dirt is removed, use a body brush to flatten out and smooth the hair using long sweeping strokes. Just as with your horse's face, take care when brushing his legs as they are bony and have tender skin. Use a soft brush on your horse's legs. I prefer to simply use my hands or use a grooming mitt. Using a mane comb, gently comb through your horse's mane. Using a little bit of detangler first helps when combing out the mane. Don't force out tangles with the comb and pull out hairs, instead remove tough tangles with your hands. Use a stiff brush from underneath to further comb out the mane, followed by a soft brush to lay it back down. Just like the mane, spraying your horse's tail with detangler will make brushing it easier. Use a stiff brush to clean and brush the tail. Use your hands to remove tough tangles and avoid breaking hairs. Use a body brush from top to bottom of the tail a few times to make it flowing. Use a towel and wipe it over your horse's coat to help bring out the shine. You can spray the towel with conditioner to bring out more of the shine. During the summer months, it's a good idea to apply an application of fly repellent all over your horse. Apply hoof dressing to help keep your horse's hooves moisturized. Give your horse a small treat when you are done grooming him to further show your appreciation of him. Regular horse grooming with the same routine will cut down the time needed and will make it more enjoyable for both you and your horse.